There are two parts of this review, first one is the processor and the second is the motherboard. While the review mainly focused on the motherboard, the processor is something to talk about as they are an essential part of this yearly upgrade cycle that Intel is bringing to consumers. Intel Kaby Lake series brings us the 7th generation processors in the mainstream market. They feature what Intel’s calls their most optimized 14nm node, 14nm+. Intel also says that these processors bring performance improvements and support for higher clock speeds. Essentially, Kaby Lake are a better tuned Skylake uArch for the mainstream community. But Kaby Lake isn’t as exciting as it sounds. With Kaby Lake being one of the worst Intel launches when it comes to NDA. Majority of the tech sites have already tested the Core i7-7700K processor. Yes, it is faster compared to Core i7-6700K. But as a result of obtaining faster clocks, it runs hotter and sips more power. It does what Intel promised, to deliver faster performance and higher clock speeds but it breaks the efficiency rating of Core processors which although doesn’t matter a whole lot to the mainstream audience but is some thing that goes opposite to the principles defined by Intel. So yeah, you get that 10% faster performance than Core i7-6700K and you also get than 7% clock speed bump. In return, you get higher temperatures that are much worse when overclocking (The Core i7-7700K can do 5 GHz with ease provided you have a beast of a cooler) and with that clock bump, you get higher power consumption. Lastly, there’s no IPC increase. Kaby Lake is the same as Skylake with higher clock speeds to simply put it. And the worse thing is that it might be so for the next 2-3 generations. Upcoming Intel Core series such as Coffee Lake (Kaby Lake Refresh) and Cannonlake will be bringing no incremental IPC improvements and will add more cores for better performance throughput. So without further to say, Intel Core i7-7700K is without a doubt, the fastest mainstream chip in the market but it has too many drawbacks in terms of power and temperatures that make Skylake still look as the better option for gamers. ASUS is back with their ROG STRIX lineup which has gotten even more advanced with the 200-series generation of products. ASUS STRIX boards blend in RGB with a beautiful design scheme that stands out of the crowd. Being cheaper than the more high-end Maximus series, these boards are more geared towards Gamers with just the right amount of specs and features to be a great product for this market segment. The board has a good overclock support that can get your chip stable to clocks around 5 GHz, it can support some really fast memory at 3866 MHz (DDR4) and comes with multiple M.2 slots to support those faster next-gen SSD drives utilizing NVMe standard. The motherboard features a bundled Wireless module which other manufacturers don’t include on their similar priced Z270 boards. This product also comes with a 3D Printing Friendly design. So if you have some 3D printed designs lying around, you can just slap them on this motherboard to increase its aesthetics quality. The whole RGB design is also elegant with cuts out on the heatsinks and I/O cover that display LED illumination from your choice of colors. 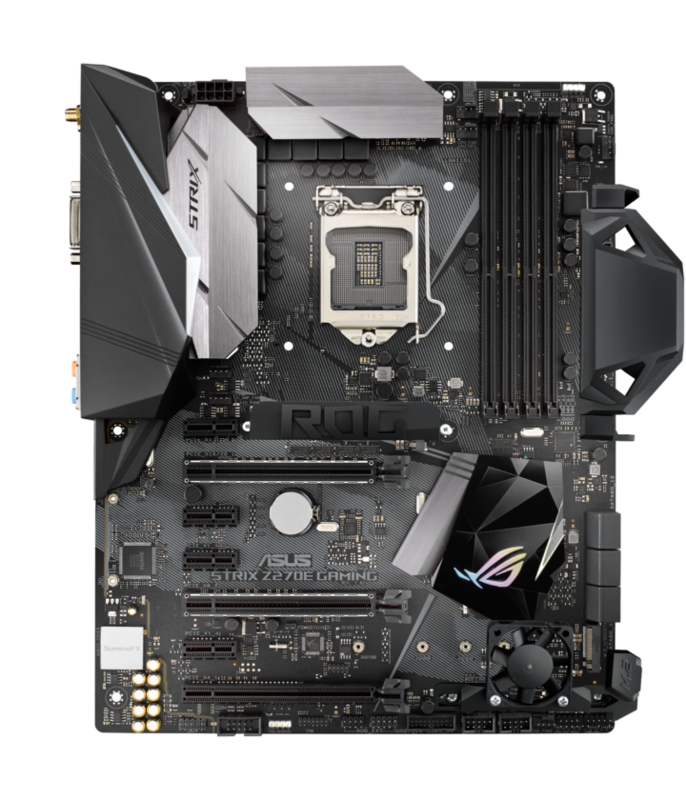 The ASUS ROG STRIX Z270E Gaming costs $238 US which is a very competitive price as most Z270 products are found in this range. This is also a test for this motherboard whether it can survive the huge competition from other Z270 products within the gaming market as it packs one of the best and balanced design out of the boards we tested. The ASUS ROG STRIX Z270E Gaming is a very balanced board in terms of features for its price of $238 US. We found it very interesting as a great product designed for gamers that packs all the features a gamer or enthusiast would ever want in a quality priced board.